Welcome to another episode of the famous Friday Fishing Report! This week is a good one. We have a bunch of cool content for you and some good updates from the local fisheries. If you guys are getting out fly fishing for steelhead or are preparing to get out, we have just released a great video with Fishing with Rod called Dissecting a Steelheader’s Fly Box. It goes over the concepts that Matt uses to choose flies for steelhead fishing and you get a peek inside his fly box. Check it out here. On a product front it is that time of year again when many of us are escaping the cold and heading down south. We just got a big shipment of warm water lures for jacks, roosters, GTs and barracuda. We thought it would be a cool addition to revisit Matt’s How to hijack your family vacation with a travel spinning rod article. 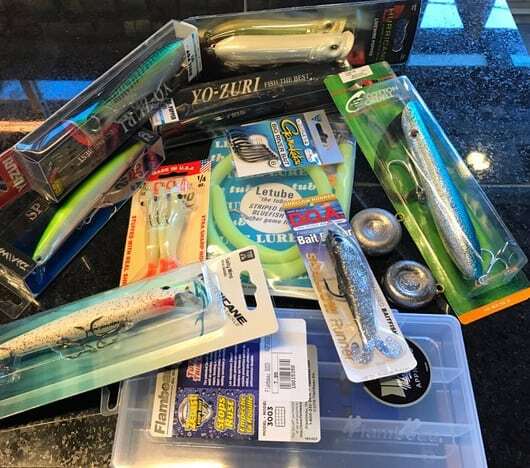 We have updated it and if you are heading on a vacation and would like to sneak in some fishing or you are specifically traveling for a fishing trip be it a fly or gear trip this article is worth looking at. Ok, on to the report information. We have an update on the Vedder. The water is at a good height but we are seeing issues with coloured water due to slides in the upper river. We have heard of fish being caught but the water clarity is making things more challenging than normal. Check out the info we have in the Vedder report in the river section below. The Squamish continues to be good and the road to the upper river is accessible as of Thursday. There may be some snow in the forecast but we are betting that it will be ok. Jordan hit the water this week and has some good updates for you if you are planning a trip. We have our Egg Fishing Course next week so we should have even more info then. The Stave and Capilano reports have updates. We have still not heard much from the limited reports coming in but they are worth looking at and should see some steelhead and egging opportunities. Lastly Jason has a saltwater update and again the news is positive. Good numbers of winter chinook are being hooked. See his update at the end of the report. There is still time to sign up for our upcoming classes! If a class is sold out you can always call and have your name added to the waitlist as we may add additional dates. In this fishery, 10% of the anglers catch 90% of the fish. This is your chance to learn from the 10%! 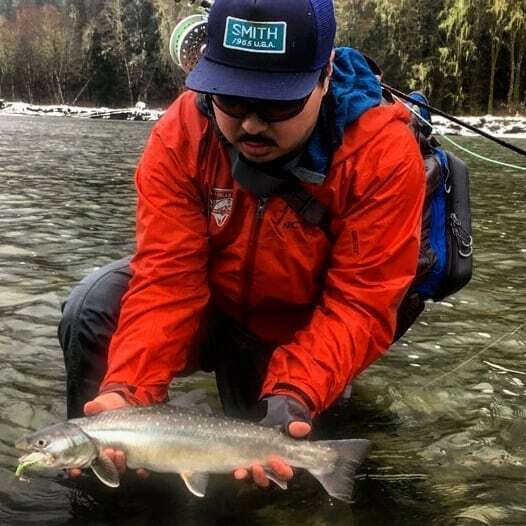 Our 3hr evening seminar will educate you on the gear, water types, conditions and other key variables that put veteran steelhead anglers in that 10%. Mastering this fishery will make you the envy of your friends. Introduction to Fly Tying – SOLD OUT!! CALL TO ADD YOURSELF TO THE WAITLIST TODAY FOR ADDITIONAL DATES! Stay tuned for potential new on the water dates to be added. If you’d like to get out on the water in February give us a ring and we’ll add you to the waitlist. Two years ago I did a little article on warm water travel spinning rods. It was fun and had a ton of response from our readers. We looked at how to hijack your standard family vacation with a travel spinning rod so you can spend mornings walking the beaches. In this 2018 update we are going to look at all the gear you might need to highjack the family beach vacation but not only that, I am going to also recommend that you look at a similar spinning rod setup if you are doing a warm water fly fishing trip. This may raise a few eyebrows and I have had a number of purists fly fisherman feel that a spinning rod is cheating. I will leave this debate up to you but I will say I love fly fishing and for the most part I will choose fly fishing over gear fishing. I have been on a number of trips where the conditions, location or simply the timing made fly fishing a futile exercise. These were the times that I was very happy to have packed a spinning rod. This year we have expanded our warm water gear section with the addition of the Savage Gear line up of top water baits. These poppers and pencil poppers are perfect if you are traveling to Mexico, the Caribbean or South Pacific. We have a great selection of poppers skip baits and diving lures in stock. If you are a conventional gear angler on the family vacation or a fly fisherman who wants to join me on the dark side what do you need? Depending on your location there are a couple things you want to look for in a 3-4 piece rod. If you love hanging out on beaches a longer surf rod is the way to go. We carry the Rapala 9’6 Baja. It is great, comes with a tube and is relatively cost effective. Now the only down side to this rod is that it is a little long for boat fishing and a little clunky for shallow water flats fishing. If you want an all round rod that can fish the beach, boat or flats, the shorter Rapala 7’6 Baja Rod is one of our most popular choices. Now if you are going specifically for flats fishing, a nicer high-end rod that has a number of weight options to match fish species is ideal. My favourite is the TFO Signature Series Travel rods and they come in bonefish to tarpon size line ratings. They are 3-piece, have an awesome warranty and cast as nice as a 2-piece rod. Last but not least, as an honourable mention for travel rods, we have the Ugly stick 3-piece. It’s ugly, very cost effective and though it is not a great casting tool, when it comes to trips where the spinning rod is an afterthought, it is nice not to care too much about the gear. The Ugly Stick is bomb proof and at a price where you can give it to a young angler on the beach after you are done. It is $69.99. If you will be targeting the really big warm water species, think sailfish, tuna, giant trevally and mature tarpon you can absolutely do it with the rods I have listed above. That said we can’t make any promises you won’t come home with a great fishing story and a 4-piece rod that has magically turned into an 8-piece rod. I am doing a trip to Christmas Island again in a few months and off shore GTs are going to be in the mix. If you are looking for a rod to specifically target big species I have experience with a number of higher end rods and we can order them in for you. Both Diawa and Okuma make some excellent options. Come down to the shop and talk to me. I will need a little lead time but I can get the perfect rod for your trip. The Rapala Baja Travel rod paired with a Penn Spin Fisher. Now you will need a reel to go along with you rod. If you are doing a casual trip using any medium to large size spinning reel that you have from salmon fishing will work. I recommend coming down and having us spool it with braid to get more capacity and stronger line but you will be in the game. If you want to be a little more dedicated or are doing a fly fishing trip where the reel will be out in the saltwater elements all day long, investing in a saltwater safe reel is important. The best cost effective spinning reel in this class is the Penn Fierce. Its bigger brother is the Penn Battle. I own two of these reels and love them. They have been around the world with me and are tough. For anyone planning on doing this a fair amount the battle offers improved saltwater durability and is fully recommended. Last year we stepped up in the saltwater reel department. We started offering 3 very heavy duty reels. The Daiwa BG, the Diawa Saltist and the Penn Spin Fisher. We have been fishing and selling them for over a year now and though they are more expensive than the above reels they have stood up exceptionally well and if you are going to be doing a fair amount of this style of fishing we recommend you look at them. With reels and rods covered you need to think about tackle. There is a huge selection but for me I like to keep things streamlined. I pick up a medium size flambeau box that I can tuck into my sling pack and I load it with 4 different styles of lures. Our standard warm water lure kit. I always have a bait setup that I can cast out, lean back with a beer in a lawn chair and see what come down the beach. I take 2-4, 3-6 oz dollar weights, a pack of swivels, a bead and 2 sizes of saltwater hooks. One small # 4 hook and one large 3/0 hook. I usually then hit up a local restaurant for squid or shrimp and the set up is ready. The second lure I bring and easily my favourite is top water popper fishing. 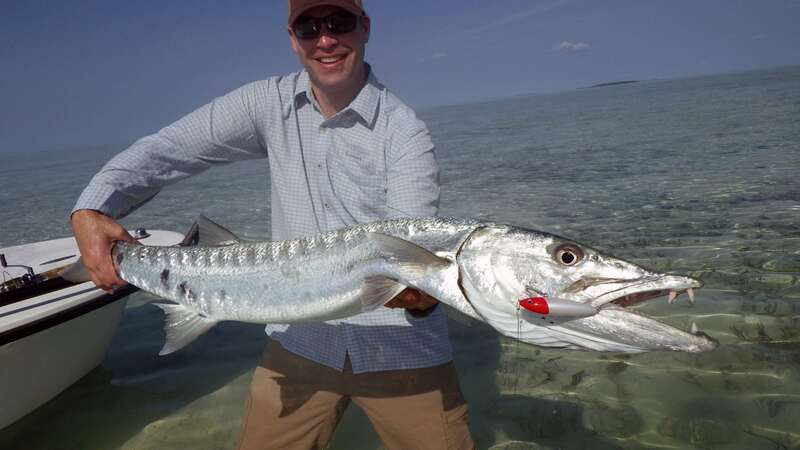 These work almost anywhere for barracuda, jacks and a ton of other species. Cast out and make as much commotion on the water as fast as you can is usually the best method. We have a great selection in the shop. Now I like to fish popper style lures but pencil style lures are also always in my box. These lures don’t catch water like the popper but skip over the water like a bait fish jumping away from danger. These style of skip baits are actually way less of a work out to fish because they don’t catch as much water. In areas of heavy surf or if I know that I am going to be casting for an extended period of time I prefer this style of lure. You will be shocked at how tired your arms get when working a big popper for even a half hour. The last thing you will want is sub surface style lures and some jig style lures for fishing deeper areas off the beach, deep holes on the flats of just off shore. 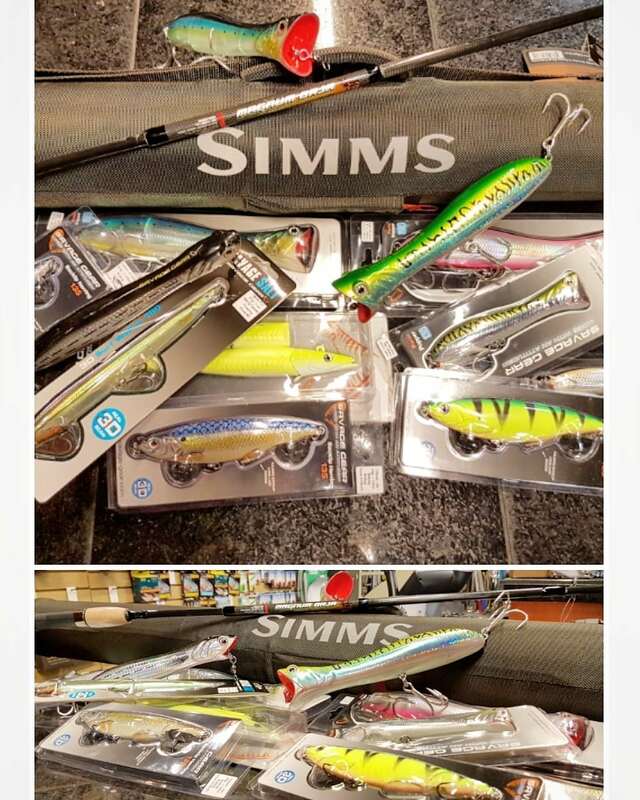 We also have a great selection of diving lures, jigs and soft plastic jigs. Finally I always include wire leaders in my kit. You might have to use them on all of the set ups if there are toothy critters around. 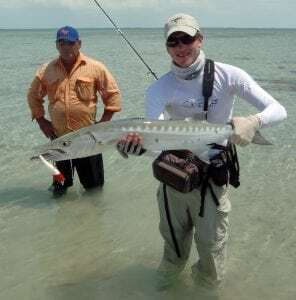 A 50lb barracuda caught on one of our fly fishing trips to Cuba on a popper – You’re a hero Gord! 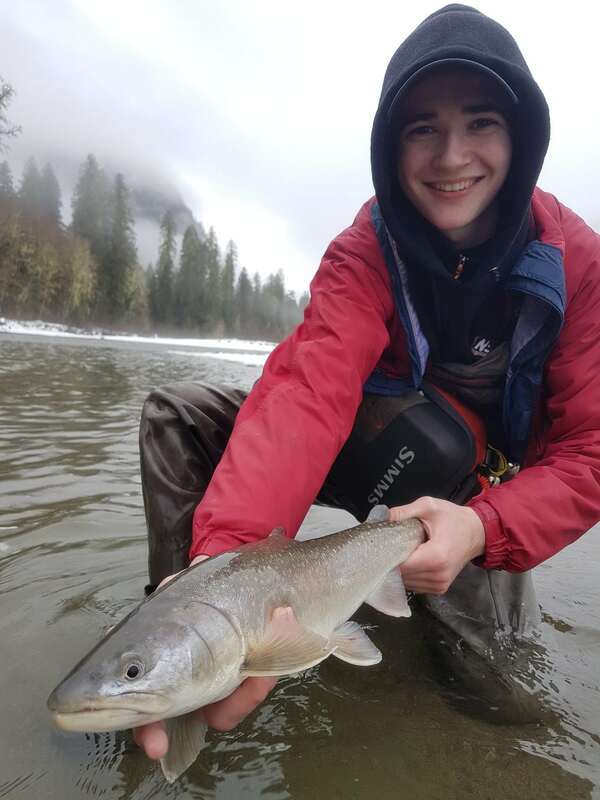 With the warm weather and the rain, the water level rose on the Vedder River this week. Usually, when the river is at this height and coming down fishing is very good. However, with the unstable clay banks the clarity isn’t at its best. With the continuous rain and snowmelt combined with the warmer temperature, we expect the coloured water to continue this week. Murky condition are not the end of the world. We have heard of a fish being caught but it does make things more challenging. Try to use bait such as shrimp or roe, or just simply add scent to your lure or fly. Also, use bigger presentations and brighter colours. This method just makes it easier for the fish to see and smell your presentation. If the water clears up downsize your presentation using smaller lures, flies, plastics, hooks and leaders. So if you are heading out make sure you bring your larger pink worms, large gooey bobs and cut your roe into larger than normal chunks. If you are fly fishing for steelhead on the Vedder or anywhere else for that matter, don’t miss out on our latest video in our Learn How with Pacific Angler series where you can take a look into What’s in Matt’s steelhead box. Good luck out there and stop by the shop and send us any pictures if you get lucky! The first steelhead start trickling in around the end of December. We do not see many steelhead on the Capilano but it is a fishery worth looking at it you do not have time to travel farther. They can be targeted with spoons, spinners, flies, or drifting colorado blades, jigs, shrimp, roe and plastic worms but the most popular method for the high banked deep pools on the Capilano is with a gear rod and a float. Come talk to us and we will show you the right setups. Steelhead are expected to be in the system until mid-March. After the steelhead fishery, around may we will see early Capilano coho come in. It’s a smaller run and the fish aren’t that big. However, they are known as one of the best-tasting coho. These fish usually shoot straight up as the water from the dam is released quite often. The best way to catch them is swinging cap buggers at the cable pool. You can also target the moving fish with spoons, spinners, or drifting with roe. After the early coho season, the fall salmon season is upon us. Only a small amount of fish trickle in when the water is low. Most of the fish will stack at the mouth of the river and wait for the river to rise up. Once the water goes up, the river is filled with salmon. You can catch these salmon by casting lures, swinging flies, twitching jigs or drifting. Remember the bait ban comes into effect from August 1st until October 31st. There is the overview of the 2018 season. Hopefully, everyone had an amazing year. Even if you didn’t let’s start thinking about what can be done better next year for a successful season. Come in the shop and our knowledgeable staff will help you gear up for all the upcoming fishery. Since last week’s report, the Squamish bumped up a bit, providing some much needed colour to the water and helped cycle fish and freshen them up. Some of the productive spots that were fishing well last week changed. Instead of being in the “spot” we found fish just above or below areas that had been good last week. This commonly happens when we get a little bump in the water. With water levels and river colour increasing, the swung fly was quite productive for us this week. At this time of year, I usually carry two rods- one for swinging, and one for egging. This allows me to fish every piece of water effectively depending on how it is set up. As for flies, I carry a variety of sculpin and standard streamer style patterns in browns, greys, olives, and whites. One of my favourite flies currently is the C3, an articulated, balanced streamer I came up with last season that has become my go-to. Though I will fish a variety of flies, the C3 has consistently been one of my top producers for bulltrout, rainbows, and even coho when tied in appropriate colours. Come down to the shop and I’ll show it to you, and which materials are needed to tie it. Jordan’s C3 balanced streamer pattern. When swinging, I like to use a 4wt switch or 5wt Spey. Though not necessary (I caught a fair amount of fish before I had these rods) I do find I can cast farther easier, allowing me to cover more water effectively. Regardless of the rod used for swinging, carrying a selection of sink-tips or versi-leaders can pay dividends. I have fished runs effectively finding fish using T-11, working my way down stream, only to re-visit the spot near the end of the day and having to switch to T-8 because of the dropping water. In the single-hand world, the same can be said with Type-VI and having to go to a Type-III, or vice-versa and you have to increase your sink rate. Keep in mind, sink rate does not indicate how far it sinks, but rather how fast it sinks. This is important when trying to time your swing or drift through a bucket, riffle, run, or pocket- or when trying to effectively fish a piece of structure from where you are positioned. Jordan With a nice fish caught on a C3 streamer. With cooler temperatures mixed with clear skies, we can expect the water to start dropping again and clearing up. Keep in mind that clear water can be deceiving, and to wade safely: what might appear to be shallow, can actually be deep. Though I focused this report on swinging flies we did use beads quite a bit when I was out last and it put a number of nice fish to the bank. Sean was out and focused a bunch on the bead rig. He hooked a number of really nice fish. And remember, if you come across some loose change, don’t be surprised- fish keep their money in the river bank. My fishing time has been limited in the last two weeks but I did manage to sneak a peek at the Stave earlier this week. Water levels have been fluctuating between moderate to low flow and have been gin clear from what I’ve seen, making finesse fishing somewhat crucial. The trout and whitefish fishing can be hit or miss; maybe not a day’s worth of fishing but definitely worth a look for a few hours if you are in the area. If they are there you will get them. 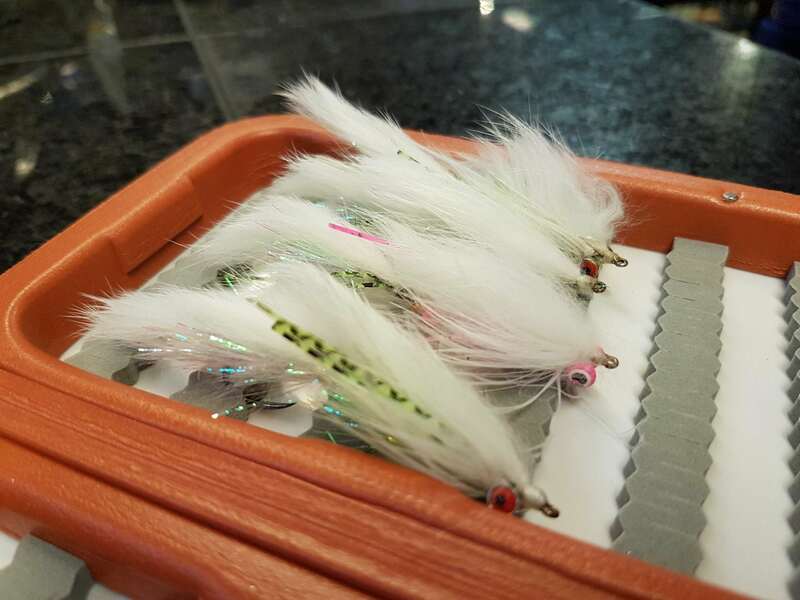 Targeting trout and whitefish with egg patterns is the typical go-to right now although small streamers and spinners/spoons can also get them when they aren’t clued in on the eggs. 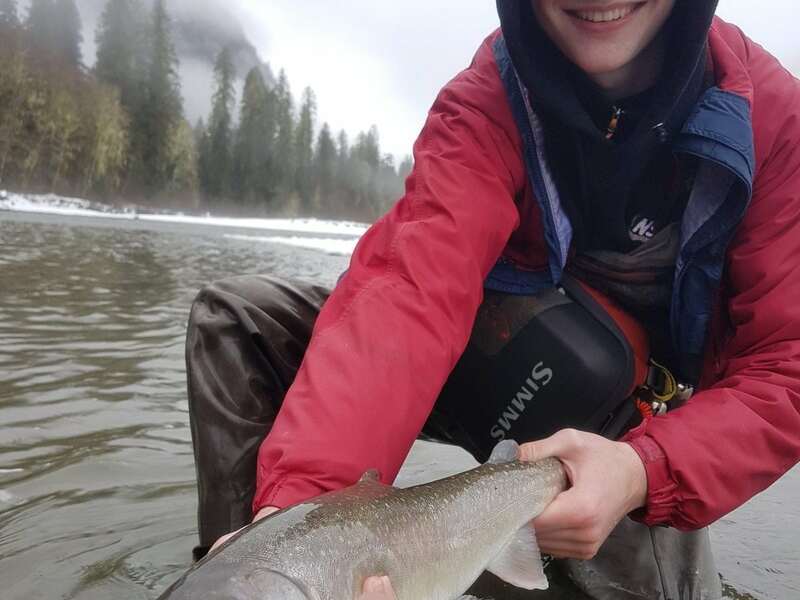 Historically this is also when the Steelhead start showing up in this system; there aren’t a lot compared to the Vedder or Chehalis but factoring in that it is a short river it is very possible that you can put your hook over at least a couple of them. Presentation wise there aren’t any secrets; your roe, shrimp, pink worms, spoons, and streamers will all produce. We didn’t catch any steelhead when we were out but it usually takes a few trips to get luck this time of year. This is a fun fishery with a multiple species and to reiterate, it’s a short river so I wouldn’t purposely make a trip there if you are not local. However if you are in the area or are coming back from the Vedder/Chehalis and have a couple hours to spare then definitely take a look. For an overview of the Seasons on the Stave click here to see what it coming in 2018. During the winter months on the Stave beading/egging for trout and whitefish is a great fishery. There are good numbers of trout and whitefish in the system as they are gorging on eggs. If you drift with Jensen eggs, beads or egg-shaped wool in riffles behind spawning salmon, you can get these fish. Steelhead are also trickling into the system in late December. From Late December on you will be able to catch them by drifting with steelhead rigs such as plastic worm, gooey bob, corkies, colorado blades or spin-n-glos. You can also use roe or shrimp. Fly fishing is also a viable option; try steelhead patterns in different colours. The egg fishing trout fishery will last until mid February and steelhead will be in the system from now until May. At the end of the steelhead season, we will see another trout fishery in the stave river. Fly fishing with fry pattern or tossing little spoons or spinners will attract the trout that are in the system to feed on the salmon fry. This fishery goes from March to May. The river usually gets high in May and though there are still resident fish in the system all summer it is not a go to destination until fall. Early September marks the start of the salmon fishery. Once the chum salmon start coming in you can expect to hook them left and right because there are so many. Drift with jigs and if they don’t bite, play with your depth a little bit. Coho salmon will show up as well and they can be targeted with flies, spoons, or spinners. Look for frog water or structures when looking for coho as they like slow moving water. That sums up the 2018 overview of the Stave River. If you wish to try any of the fisheries mentioned above, come to the shop and we will be glad to help. The usual tactics of glow flashers with glow spoons or hootchies, fished close to the bottom, is producing fish. In last weeks report I featured some of the productive spoons we have been fishing and there hasn’t been much change there. Check out this past report for some detailed information on more productive spoons we use this time of year and some detailed information on flashers as well. Make sure you follow us on Instagram and Facebook too. In 2018 we will be posting more photos and interim reports. This weekend I am going to share some photos and videos on the work we have been doing on Salty Dawg the past few days. Next best thing to fishing for me is working on the boats. I love getting them dialled in for the winter and the upcoming summer season!